Amazon Pay Wallet is Offering The 30% Cashback Offer For All The Amazon India Users. This Offer is Valid For All users & Can Get Max Rs.30 Discount in 1 Account. 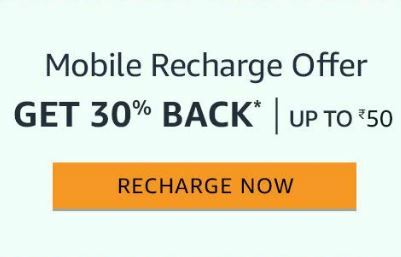 Max Rs.30 Discount You Will Get In 1 Successful Recharge. This Offer Is valid from Dec 1, 2018 to Dec 31, 2018 & You Can Do All Your Rs.100 Recharge in Just Rs.70 Even This Offer is Valid For All Operators Including Airtel. 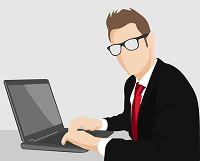 Follow Below Steps To Get The Discounted Recharge. 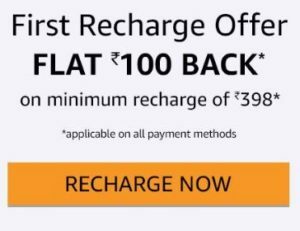 Do your repeat mobile recharge on Amazon using any payment method and get 30% cashback upto Rs.30. Offer valid from December 1, 2018 to December 31, 2018 both days included.